Inspection, identifying and assessing the specific types of wildlife pests and their populations. Documenting conditions that are conducive to wildlife such as sanitation and construction deficiencies that support infestations. Implementation of a customized solution that will result in removal of nuisance and damaging wildlife. 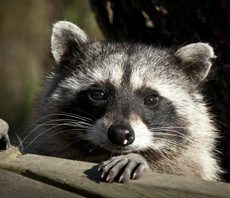 We use several different trapping and eviction techniques to eliminate wildlife problems in homes and businesses. If you are experiencing a wildlife problem, contact Wil-Kil Pest Control today for help. Exclusion. Have you heard the term? Do you know what it means? Well, the golden age of Pesticides is behind us. Pest companies no longer come to your house and douse everything--including your bed--in a heavy coating of pesticides. Though this method was highly effective at killing bugs, it did a pretty good job of making humans sick too. In this modern day, pest control companies rely on a worldwide database of pest information to "exclude" pests from your home. Think of exclusion as a sort of cold shoulder. If we were talking about a human pest, exclusion would come in the form of, perhaps, not answering the door, not returning a phone call, or putting a lock on the door. We talk a lot about the dangers of rodents inside of homes and businesses but we don’t want you to forget that there is a threat of rodents outside as well. Meadow voles, also known as meadow mice or just voles, are a serious threat to the landscaping and even grass on properties of both homes and businesses in Eau Claire, Green Bay, Milwaukee, Madison and other Wisconsin communities. Our WI pest control professionals want to warn that as the snow melts this spring, you may begin to see damage to your property from an infestation of voles.